Out of Hong Kong here is another sugar wafer cookie. Incidentally, happy blogaversary to the JSFR and for this year I have included a tag for country of origin. I haven’t yet backlinked all 8 years of JSFR but I have gone back and assigned country of origin to 2011. I’ll get around to the others but for now, country tags! I have them under ‘z’ so they all bunch in one place because I would find it very disjointing to have Japan between ‘Hard candy’ and ‘Kit Kat’. It just doesn’t parse right so all countries are preceded by ‘z’ until such time as I can figure out a better way to group them. OK! Onward. Wafer cookies. These have a nice subtle strawberry flavor which might not be fresh berry but it certainly isn’t labberry or manufactured. There isn’t a huge strawberry flavor, sadly, which means the cake cone of the wafer comes through much more than it does in the American sugar wafer cookie. Garden wafers are also a lot less sweet which is great if you want to eat more than one of these and not fall into a diabetic coma from the sugar. American sugar wafers are big on the sugar. American wafers are also big on the gritty sweet frosting layer which these are not. Garden has 4 thin layers of light strawberry frosting between 5 layers of slim cake cone wafer cookies. The wafers are a good solid cake cone flavor and are quite crumbly. If you aren’t careful you might wind up wearing more of these than eating them. 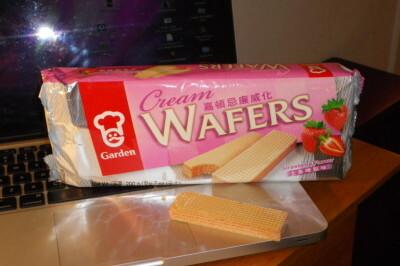 These are a decent wafer cookie, perhaps a little lacking in the strawberry flavor but what is there is a good solid strawberry. It’s nice to be able to taste the cake cone of the cookies and it’s also nice not to be sweeted out after a couple cookies.